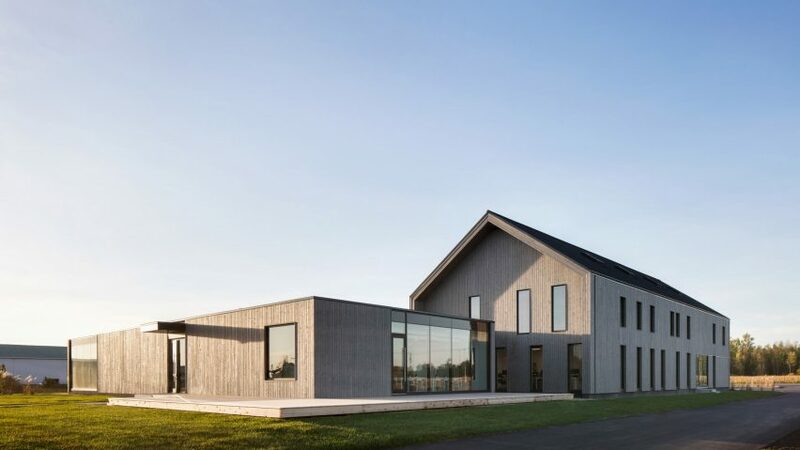 Canadian firm Maurice Martel Architecte has designed a contemporary wooden barn to house offices for an insurance company, blending in with the rural surroundings and vernacular architecture. The complex measures 13,460 square feet (1,250 square metres), split across two large, timber buildings. Exteriors are clad in grey-tinted spruce, laid vertically, with ample glazing that adds a contemporary touch to the rustic design. Based in Montreal, Maurice Martel Architecte designed the project for Canadian home and vehicle insurance company Lareau. The structure serves as its offices in Napierville, a small town midway between Montreal and the border with the US state of Vermont. The two-storey building has a pitched roof like a barn, while the lower, rectangular structure is topped with a flat roof. Together they subtly resemble other barns and industrial warehouses in the rural town. "To [fit] in while standing out is the challenge raised at the new headquarters Lareau insurance office," said Martel. "Built on the side of the road, the building that stands in the middle of the fields is reminiscent in the distance with its dark wood and its diagonal that reinforces the angle of the roof to the rural aesthetic." The project, named Standing in the Middle of the Field, aims to balance rustic simplicity with contemporary design. "Settling in a rural area without aesthetic qualities, the project aims to inspire the beauty and encourage this industrial area to change by hosting more projects sensitive to design," said the architect. The barn-like structure accommodates 50 offices, with a half-glazed wall on its southe facade. A small footbridge connects these offices with the common spaces in the rectangular unit. "The choice to make the cathedral ceiling apparent [in the two-storey building], made possible by an external insulation of the roof, allows the space to breathe in height and gives the impression of small volumes of work to float," said Martel. Sound insulation was also crucial to the design, since many of the employees spend a lot of their time on their phones. The majority of offices spaces are enclosed to further fulfil this need for privacy. The bright interiors by Canadian designer Linda Fillion have an almost industrial feel, which subtly contrasts with the rustic exterior. The internal spaces are bare and contemporary, with stark white walls and exposed duct-work, along with polished concrete floors. The common area includes a spacious kitchen and lounge area, which features white tiles and cabinetry and pale wood furniture.